The 99th United States Congress was a meeting of the legislative branch of the United States federal government, composed of the United States Senate and the United States House of Representatives. It met in Washington, D.C. from January 3, 1985, to January 3, 1987, during the fifth and sixth years of Ronald Reagan's presidency. The apportionment of seats in the House of Representatives was based on the Twentieth Census of the United States in 1980. 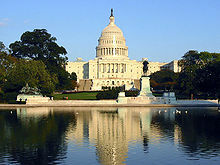 The Republicans maintained control of the Senate, while the Democrats maintained control of the House of Representatives. This was the most recent session of Congress prior to the 116th which featured a Republican Senate/Democrat House split. January 20, 1985: Ronald Reagan was privately sworn in for a second term as U.S. President (publicly sworn in, January 21). January 28, 1986: Space Shuttle Challenger disaster: Destruction of the shuttle and death of the crew shortly after lift-off. April 15, 1986: Operation El Dorado Canyon: At least 15 people die after United States planes bomb targets in the Libyan capital, Tripoli, and the Benghazi region. October 21, 1986: The Marshall Islands achieved independence from U.S.-administered UN Trusteeship and became an associated state under the Compact of Free Association. November 3, 1986: The Federated States of Micronesia achieved independence from U.S.-administered UN Trusteeship and became an associated state under the Compact of Free Association. November 3, 1986: Iran–Contra affair: The Lebanese magazine Ash-Shiraa reported that the United States has been selling weapons to Iran in secret to secure the release of American hostages held by pro-Iranian groups in Lebanon. November 4, 1986: United States general elections, 1986: Congressional Democrats regained (+8) their Senate majority (55-45), and slightly increased (+5) their House majority (258-177). Chief Deputy Majority Whip: William Vollie Alexander Jr. Senators are popularly elected statewide every six years, with one-third beginning new six-year terms with each Congress, In this Congress, Class 3 meant their term ended with this Congress, facing re-election in 1986; Class 1 meant their term began in the last Congress, facing re-election in 1988; and Class 2 meant their term began in this Congress, facing re-election in 1990. (3) John Porter East (R) Died June 29, 1986. (3) Jim Broyhill (R) Interim appointee lost special election. Illinois's 14th John E. Grotberg (R) Died November 15, 1986. North Carolina's 3rd Charles O. Whitley (D) Resigned December 31, 1986. Public Printer of the United States: Ralph E. Kennickell Jr.
Secretary for the Majority: Howard O. Greene Jr.
"Videos of House of Representatives Sessions for the 99th Congress from www.C-SPAN.org". "Videos of Senate Sessions for the 99th Congress from www.C-SPAN.org". "Videos of Committees from the House and Senate for the 99th Congress from www.C-SPAN.org". House of Representatives Session Calendar for the 99th Congress (PDF). Congressional Pictorial Directory for the 99th Congress. Congressional Pictorial Directory for the 99th Congress (Revised). Official Congressional Directory for the 99th Congress.